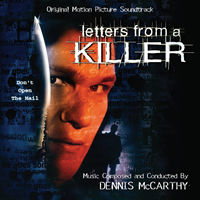 BUYSOUNDTRAX Records announces the release of LETTERS FROM A KILLER, featuring music composed by Dennis McCarthy for the 1998 thriller directed by David Carson (STAR TREK: GENERATIONS), starring Patrick Swayze, Gia Carides, Kim Myers, Olivia Birkelund, Tina Lifford, Elizabeth Ruscio, Roger Mosley, Bruce McGill and Mark Rolston. LETTERS FROM A KILLER tells the story of Race Darnell (Swayze), a man who is struggling to resolve a potentially deadly case of mistaken identity. Though he stubbornly insists he is not guilty of the murder of his wife, Race is sent to prison. While he is behind bars, Race finds comfort in corresponding with four separate women through tape-recorded letters. One day, he accidentally sends one tape to the wrong woman and gets a response from her claiming she is going to kill him. After his second court appearance, he is finally freed from prison only to then be framed for two more murders which he did not commit. With his freedom at stake, Race struggles to clear his name and find out who is setting him up before time runs out. For LETTERS FROM A KILLER, Dennis McCarthy wrote music with an Americana flavor, very different from the kind of music he was known for writing at the time for the STAR TREK franchise. LETTERS FROM A KILLER provided Dennis with an opportunity to do something different, a score with a bluegrass flavor that would also allow Dennis to switch gears and write atonal music for some of the darker moments in the film, similar to something Ry Cooder or W.G. Snuffy Walden might compose. Also included on the album is a suite of film noir themed music Dennis composed for a student film. BUYSOUNDTRAX Records presents LETTERS FROM A KILLER, featuring music composed and conducted by Dennis McCarthy. This is a limited edition release of 1000 units. The first 100 copies will be autographed by composer Dennis McCarthy.